During two decades as one of Prime Minister Hun Sen’s closest allies, Deputy Prime Minister Sok An accrued an astounding collection of positions that gave him unparalleled clout within the CPP’s sprawling bureaucracy. 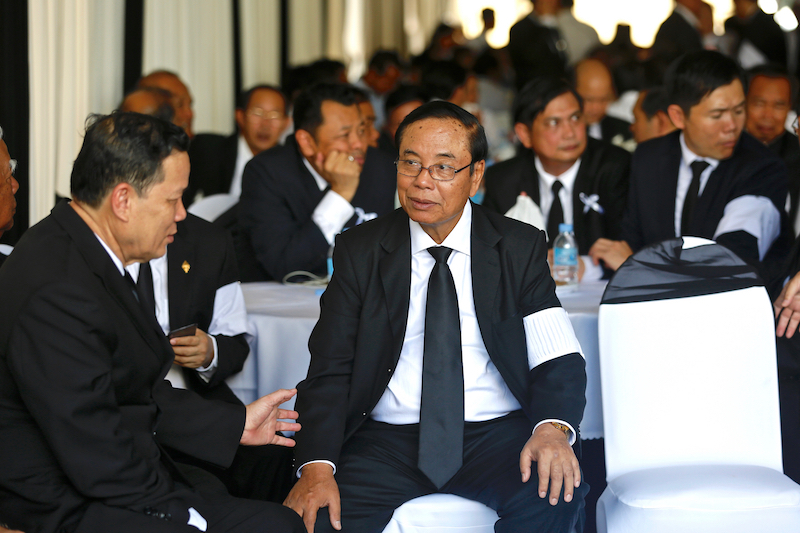 Though some of that control had slipped away in recent years, there are still plenty of state bodies, official roles and chairmanships up for grabs after Sok An died on Wednesday at the age of 66. The most high-profile of those positions, minister in charge of the Council of Ministers, was promptly handed yesterday to Deputy Prime Minister Bin Chhin, 67, who is also organizing the funeral of his predecessor. CPP spokesman Sok Eysan said yesterday that Mr. Chhin—who, like Sok An, has been a chief negotiator for the party—was chosen because he demanded the respect of fellow ministers, and that the role would be made permanent once endorsed by the National Assembly. “I think it will be endorsed in April. He has already had influence in the Council of Ministers, so everyone respects him,” Mr. Eysan said after the government released a statement about the appointment in the morning. The role of minister in charge of government ministers was created specifically for Sok An in 2004, and apart from Mr. Hun Sen, nobody wielded the same breadth of influence on the CPP’s bureaucracy. Though Mr. Chhin has kept a relatively low profile, he too has proven to be one of Mr. Hun Sen’s most trusted lieutenants. A member of the CPP’s central and permanent committees and a lawmaker for Prey Veng province, Mr. Chhin’s role as head of the National Authority for Land Dispute Resolution is among the most sensitive in the government, given the deep anger of many in Cambodia over the loss of land to private companies, often with the involvement of government officials. As elections approach, Mr. Chhin has not minced his words when it comes to the importance of enacting crucial reforms, particularly in dealing with land, which has increasingly become part of the mandate of the Environment Ministry. “When the Ministry of Environment fails, I fail,” he told officials during an annual progress meeting at the ministry in December, calling on other ministries to cooperate with Environment Minister Say Sam Al in managing protected areas and economic land concessions. “When you lose the commune council elections and the national elections—you lose your job,” he warned them. 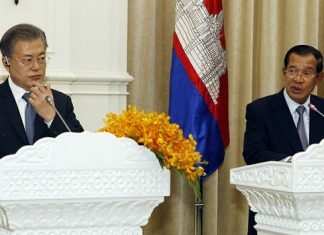 Mr. Chhin also served as president of the Constitutional Council of Cambodia between 2001 and 2007, and led talks with the opposition CNRP during the political crisis in the wake of the last disputed general election. Political analyst Cham Bunthet said that the appointment of the CPP veteran, who, unlike Sok An, is not known for developing deep patronage networks, could be a positive move by the ruling party. “I’ve known of that guy for quite a long time, and he’s quite old, for one thing, but he’s very mature and his reputation within the party is quite good among the members and party leadership. But the good thing is that he is, to me, a little bit selfless,” Mr. Bunthet said. “He’s not those who have greed for power or greed for money, he’s a little bit open and what I have learned from him is that young people in the party give him a lot of respect, so I think that this appointment is good,” he added. Mr. Bunthet said the appointment of fresh faces in Sok An’s vast array of government bodies could also bring about the possibility of reform. “[Mr. Chhin] held that one position, another 19 positions would be given to the CPP youngsters who…have great passion to get into those administration positions to show that they are good enough to get a better job,” he said. 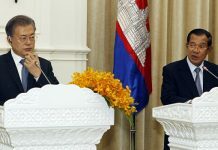 “After the last election, Hun Sen realized that the over-concentration of power and wealth in Sok An’s hands had become a liability, so instead of creating another grand-vizier to Hun Sen’s sultan, it is likely that the CPP will seek a competent and loyal administrator to keep the main nerve-center of government humming,” he said in an email. 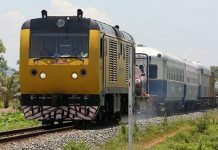 His sons are Sok Puthyvuth, who is married to Mr. Hun Sen’s younger daughter Hun Maly and is head of the Soma conglomerate, as well as chair of the Cambodia Rice Federation; Sok Sokan, who became the youngest member of parliament when he took a vacant seat in 2015; Sok Soken, an undersecretary of state at the Foreign Affairs Ministry; and Sok Sangvar, a senior official at the Apsara Authority, which oversees the Angkor Archaeological Park.